With the challenges a Northeast Ohio winter brings, you’re probably questioning how to ensure accessible sidewalks and parking lots for your employees and tenants, regardless what time of day the snow storm hits. So, where do you start? 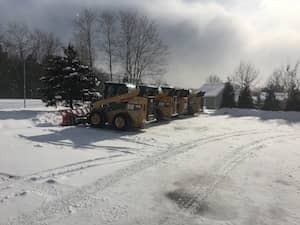 At Turfscape, we believe if you use these questions as a guideline while gathering information to secure a commercial snow removal contract, you will have a better chance of being satisfied with your final selection. What is your salt availability? In regards to safety and accessibility concerns, it is important for your snow removal contractor to ensure salt availability throughout the entire winter. What is your deployment and/or emergency response plan when a winter storm is on the horizon? It is pertinent to understand your snow and ice management contractor’s overall plan including response time, available equipment and number of employees. Do you consult with a meteorologist firm? Weather reports for upcoming storms allow your commercial snow removal contractor to plan for the predicted weather and communicate the proactive plan to employees and customers. What will the communication be before, during and after a storm? One point of contact will allow you to know what the plan is, how many times your contractor visited the site during the storm and what services were performed. What kind of equipment will be dedicated and used on my site? Do you have enough equipment to allocate and park on our site? If not, what is your plan to rollout trucks and report to our property? How can I be sure my property will be plowed on a consistent basis throughout the storm? How often can we expect a truck back on our site? For example: every eight hours? We have unique hours and are open on holidays, can you accommodate our needs? Do you have any satellite locations that can assist with salt reloads or supply extra equipment and labor? Having access to multiple salt locations, along with extra equipment and labor assists with any unforeseen challenges like equipment breakdowns, road inaccessibility due to accidents and employees not reporting to work. Can you supply references of current customers? It is a good idea to check with similarly sized properties to discuss the prospective contractor’s performance versus the expectations listed in the signed contract. What type of contracts do you offer? For example: seasonal, per application, variable trigger depth, lane-plow pricing, salt by the ton, or customizable to my property’s needs. Using these questions as a guideline in your commercial snow removal contractor selection will help give you peace of mind that your property will be accessible and safe whether it’s morning, afternoon or the middle of the night.